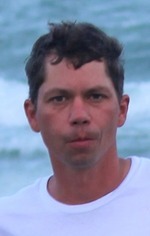 Joplin, MO–Brad Alan Windle, age 44 of Joplin, Mo. passed away on Saturday, June 23, 2018. Brad was born on December 11, 1973 in Joplin, the son of Rockie Windle and Debbie (Gehrs) Artinger. He has been a lifetime area resident, he worked as a welder for the Lozier Corporation. Brad loved being on the water, fishing and boating, he enjoyed music, but most of all, he loved spending time with his children. He is survived by his children; Briana, Leanna, Braiden Windle, all of the home, and Austin Windle of Kentucky, his mother and step-father; Debbie and Dennis Artinger of Galena, Ks., his father; Rockie Windle of Joplin, his maternal grandfather; W.L. Gehrs, Jr. of Joplin, a sister; Abbey Metzinger and husband Wade of Tulsa, Ok., and many loving friends. Services have been scheduled for 2:00 p.m. Friday, June 29, 2018 at the Mason-Woodard Chapel. Burial will follow at Ozark Memorial Park Cemetery.